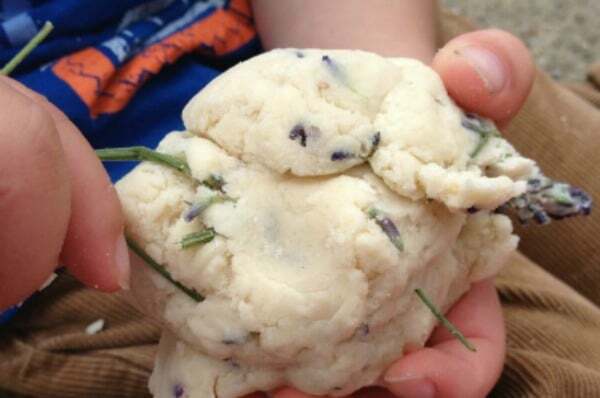 This lavender playdough recipe is super easy to make – as you’ll see with supervision and a tiny bit of help my kids were able to help make this themselves. 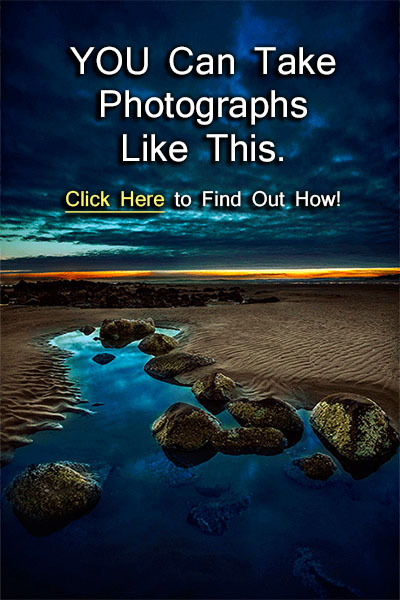 If you like this recipe and would like to make it yourself make sure that you bookmark this page or pin an image so that you’ve got this to hand when you need it! 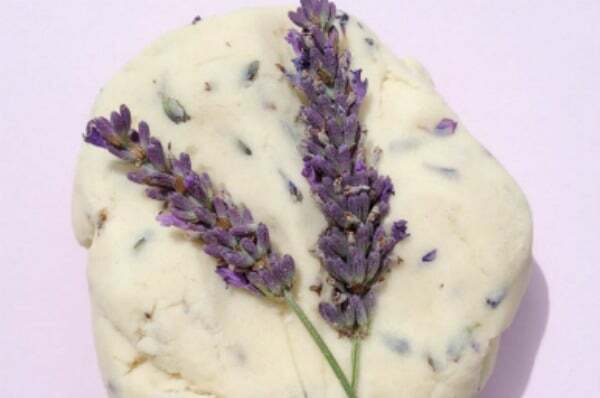 How do you make scented playdough with lavender? Add all the ingredients into a bowl, adding the water last bit by bit so that you get the right consistency. If our playdough is too wet I normally just add a bit more plain flour and this normally sorts it out. I had rather thought that this would be an activity that I would just do with my son but when my one year old daughter saw us nipping out into the garden to grab some lavender off a plant she became determined to be involved. Obviously if you are doing this with small kids or that like to put things in their mouths then you are going to have to be a bit vigilant here. This much salt is not good for kids eat and boiling water is involved, I’m sure you know these things but I’ve been sleep deprived too so I like to remind people! 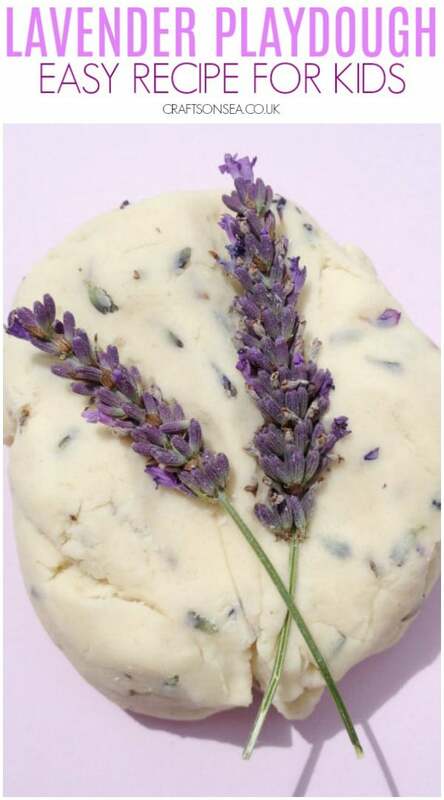 We used fresh lavender from our garden but if that’s not available you can buy dried lavender flowers to use. To make the playdough it really is as simple as mixing all the ingredients together. We measured them out together (good counting practice for younger kids too) and then I added the hot water and mixed it until it had cooled enough for the children to join in again – this is actually really quick. The kids both did a great job at mixing the ingredients together and kneeding it to make a dough. Because both kids wanted to make this together I decided to put the bowl on the kitchen floor. You would be right to question my sanity but actually it only took a couple of minutes and a few baby wipes to clean up the mess. Both kids loved putting the flowers into the dough. I’m of the belief that anything that’s slightly naughty is a winner with kids, they aren’t normally allowed to pull flowers off of plants so this was appealing to them! Due to the whole bowl-on-floor-flour-everywhere issue I didn’t worry about getting the perfect consistency, the smell and interesting texture was enough to keep them busy. As with most playdough activities this eventually descended into them burying Batman in the dough and having to rescue him, but it kept them busy for nearly an hour during which time I managed to calm down a bit too. Phew.